I don’t blame you for not wanting to walk into a store whose primary marketing method is hiring a guy to spin a sign on the street corner. Something about that just seems a little bit off. The fact that cash for gold businesses popped up on every street corner and many had a shady reputation doesn’t exactly make me want to rush in either. But that doesn’t mean selling your unwanted gold is a terrible idea. After all, it has real value, and it isn’t doing you much good sitting in a drawer. We came up with 4 reasons it might actually be a good idea to cash in your gold. During the “modern gold rush” people looked at gold charts and wrote off those selling gold as foolish. “Gold is only going to keep going up” they said, as they laughed people off the stage. Well, here we are almost 4 years from the highs in gold, and the prices are down nearly 40%. It turns out the people that sold their gold in 2011 were pretty brilliance. The point is, you can’t predict price fluctuations, and no investment like that is “always going to go up.” Gold could continue to drop, and if it does, you’ll miss out on what are still historically high gold prices. Your gold is an investment. By owning it, you’re holding on to value, and it’s value that you can’t really spend if you need it. You could always sell your physical cold and buy an ETF in gold, giving you easier liquidity if you ever need the cash. Or, invest it in something else. Maybe something a little safer – something that hasn’t dropped 40% in the past 4 years. Either way, having cash or a more liquid investment vehicle might come in handy rather than having a pile of your Aunt Mildred’s dusty, broken gold. A lot of the local cash for gold stores have probably closed (which were probably shady to begin with), as have the boom and bust online stores, so now we’re left with some of the more trustworthy people who have in business for decades. You could go to a local jeweler, but you’ll probably get a lower rate due to all their overhead. The online cash for gold companies that have survived are not only more trustworthy than other companies, but also pay higher rates. 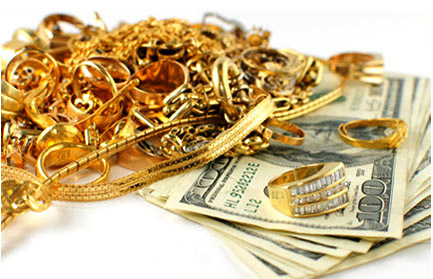 With low overhead and nationwide reach, companies like Express Gold Cash and Just Sell Gold are popular destinations for gold buyers. Now that you don’t have to sort through a bunch of crappy websites or navigate your local scammers – you can use a review site like Top 7 Cash for Gold – there’s less worry involved in the process. Most online buyers offer free insured FedEx shipping and offer guarantee periods, so your valuables are in good hands. So is selling your gold all bad? No, we don’t think so. Don’t let a few bad companies put a sour taste in your mouth. Cash in that gold and find something else to invest it in, use it for an emergency fund, or spend it on something you’ve always wanted (or maybe just buy new gold). For more information on how to price gold, the selling process, and getting the most out of the process, visit the Gold Selling Guide for a list of resources.